At St. Christopher School, learning does not begin and end in the classroom. As part of our mission to educate students to lead lives of purpose and excellence, St. Christopher seeks to offer a wide range of learning activities to enrich the experience of our students. We encourage students to strike a balance between striving for academic excellence and discovering their interests beyond the classroom. Our students work hard, but they are also involved in the numerous extracurricular activities that are available to them. We believe that involvement in extracurricular activities allows one to improve mind, body, and soul. Throughout the school year, our students are challenged to participate in various community service projects. Charity is a learned behavior. Helping those less fortunate reinforces our Christian values, teaches our kids that it is “the right thing to do”, and demonstrates how they can have a very real impact on the world around them. Students can be active in musical performances, clubs, scouting, service projects, cross country running, and more. We are always looking to enhance our enrichment offerings. The band program is designed to help students discover the joys of making music in a band. Each week, students have two hour-long band classes. The Beginner Band starts the year with several weeks of small, like-instrument before starting the full-band classes. Music makes life richer and can lead to a life-long hobby that will bring much pleasure as the years go by. 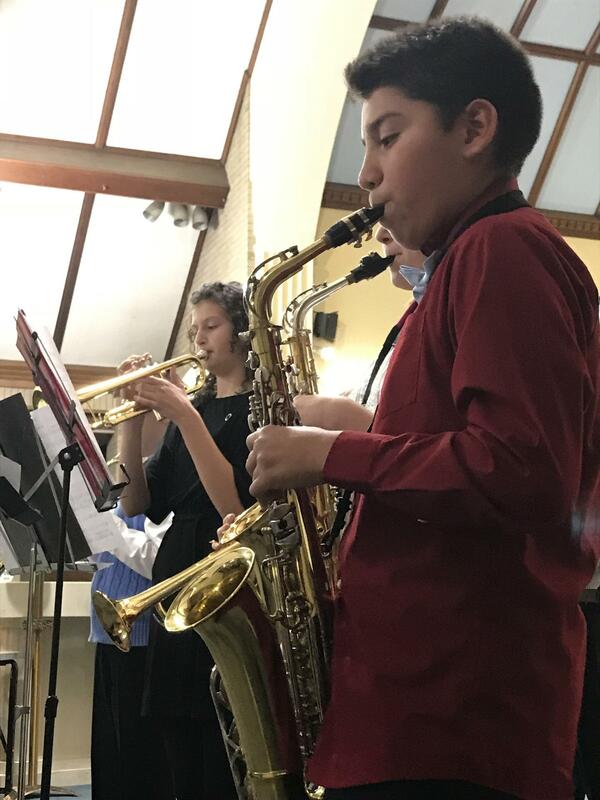 A solid foundation in musicianship and music reading skills are developed as part of the band program in addition to the foundation each student receives on the student's instrument of choice. The band classes at St. Christopher are open to students in grades 3 through 6. No previous musical knowledge is required. If students have already had some instruction on an instrument they may be placed in the Advanced Band at Mr. Bailey's discretion. Beginner Band meets on Wednesday and Friday before school at 7:45 a.m. Advanced Band meets Monday and Thursday before school at 7:45 a.m.
Students in grades 2 through 6 are welcome to join the Cheerleading Squad! This group of lively students learns the basics of cheer as they prepare to support our boys and girls basketball teams throughout their season. Practices begin in the late Fall, with basketball games scheduled throughout the winter and early spring. One of the unique opportunities here at St. Christopher School is the Chess Club. This program offers a safe, low stress environment for the children to learn and enjoy the games, while engaging in a social activity that is fun for all. Children play weekly with classmates and learn at their own pace. We even encourage parents to join us and learn the moves. This in turn give you an opportunity to play at home with your children, which quickly improves everyone's skills and offers yet another way to connect with loved ones. The Chess Club meets weekly on Fridays in 5th grade. The 3rd & 4th Grade Chorus meets Wednesdays from 10:20 -- 10:40 a.m. during and the 5th & 6th Grade Chorus meets Mondays from 1:10 - 2:00 p.m., also during recess time. Any student may participate! 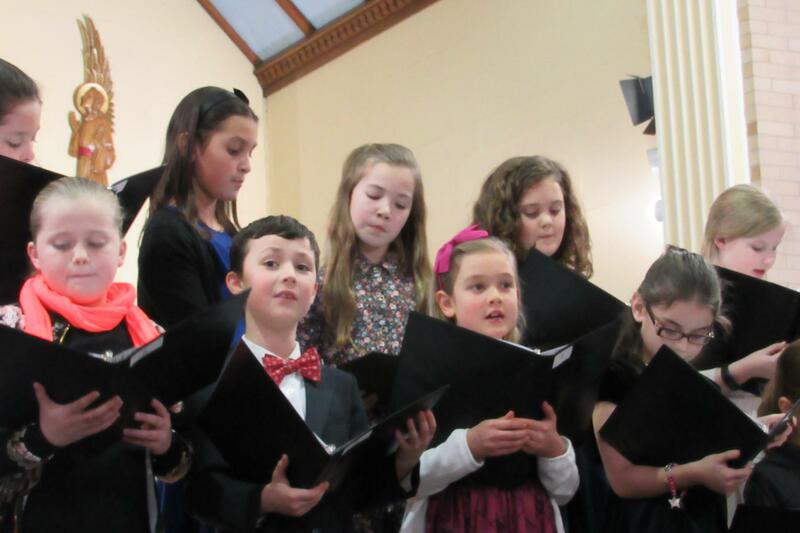 The groups sing during special school masses and are part of the Fine Arts night that is held twice a year. St. Chris has a strong tradition of helping to develop strong runners at all ages and our numerous championships show our success in making this happen. In addition to developing strong runners, we offer programs that help the experienced runners prepare for a higher level of running. This year we are offering four programs for children in grades 2-6. Grade 2-3 Program – This program is for the beginning runner and is designed to increase your child’s endurance in a fun and safe manner. The children will not only gradually increase their endurance in order to complete a 1.2 mile course, they will also learn to run efficiently with proper technique. The goal for the younger children is to have fun and learn to run at the same time. The coaches are experienced runners or are experienced cross country youth coaches or both. Grade 4-5 Program – This program is designed for both new and experienced runners. The goal is to help these children comfortably complete a 1.8 mile course and to continually improve their times with each race. In addition to increasing their endurance, the children will also learn correct and efficient running technique, so they can maximize their ability and reduce the risk of injury. The runners will train at a pace that is comfortable for them. The coaches are experienced runners or youth cross country coaches or both. Grade 6 Program – The 6th grade program is similar to the grade 4-5 program. The goals are to increase endurance and improve running technique. The 6th graders will be preparing for the Catholic School meet (they are not eligible for the City Elementary School race). The 6th graders will be allowed to participate in the Elementary School practice races so they will get a chance to race and improve their times for the final meet. The 6th grade coaches have strong running and youth coaching backgrounds. Grade 6 Advanced Program – Sixth graders who have running experience and wish to train at a higher level are invited to join the Nashua Catholic Junior High School (NCRJHS) Cross Country Team practices and possibly compete in some of their meets including the City Middle School race. The runners must meet minimum running standards to be eligible to join this program. We encourage interested 6th graders to start running now in order to be ready for the program. A separate permission form must be signed by the parent/guardian in order for a child to participate in this program. Sign-up for the Fall Cross Country programs occurs shortly before the end of school. New students who miss the sign-ups are encouraged to contact the school to be added to the cross country team list. St. Christopher’s Parish sponsors one of the largest and most active cub scout groups (called a pack) in the Nashua area. There are over 50 boys in the program who are lead by a group of 11 active adult volunteers. Cub scouts is a year-round program that features a wide variety of fun activities for boys in Grades Kindergarten through 5. There are campouts, trips to various museums, fishing excursions, hiking trips, as well as fun events like our annual pinewood derby and miniature sailboat races. During all of these events, we encourage the boys to have fun while teaching them the importance of doing one’s best (vs. winning), self-confidence, teamwork, and the importance of serving and helping others in our community. For more information, visit the cub scouts website at www.nashuacubscouts.com. 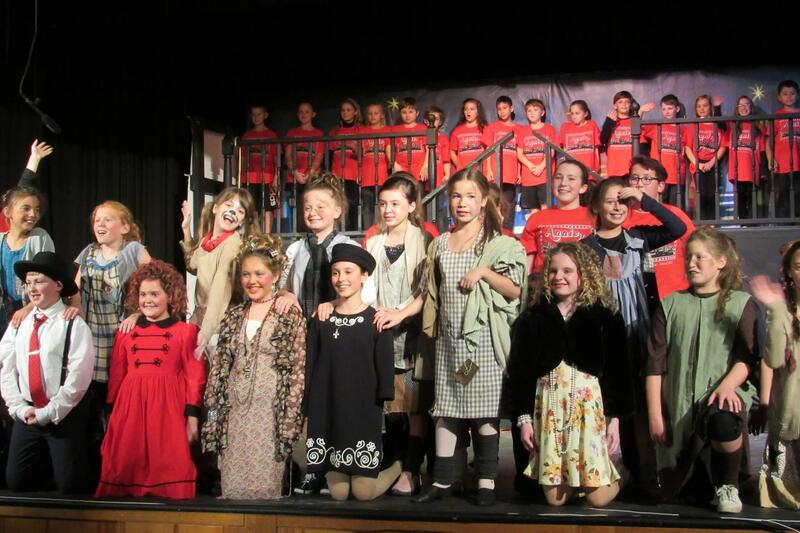 The Drama Club allows students to express themselves creatively, as they prepare one musical performance per year on the stage at Nashua Catholic Jr. High. Students are allowed to participate in many different ways, whether it be stage crew, props, or acting. Auditions for singing parts are required, however all other participation does not require an audition. Drama Club rehearsals take place after school for 8 weeks in the Fall. The Great Books Foundation is an independent, non-profit educational organization whose mission is to help people learn how to think and share ideas. Towards this end, the Foundation publishes collections of classic and modern texts for children and adults. St. Christopher students in grades 2-6 participate in the Junior Great Books Program. Through text-based discussion and the Shared Inquiry Method, this program strengthens critical thinking and civil discourse, promotes reading and the application of literature, and provides children of all ages with a powerful instrument for life long learning. Led by parent volunteers, the Junior Great Books Program exposes kids to great and diverse literature, and provides a forum for dialogue among participants. Junior Great Books meets from January through March in the morning before school. St. Christopher competes in the First Lego League for children in grades 4-6. This international event is based upon a common theme and a mission that all teams attempt to complete. A team of students design and program a Lego Mindstorms robot to complete specific tasks and then compete with other teams in an exciting regional event in November. In addition to the robot mission, the team also researches, creates, and presents a five minute report on a specific topic related to the theme. This extracurricular involves creativity, problem solving, team building, friendly competition, and most of all, fun. 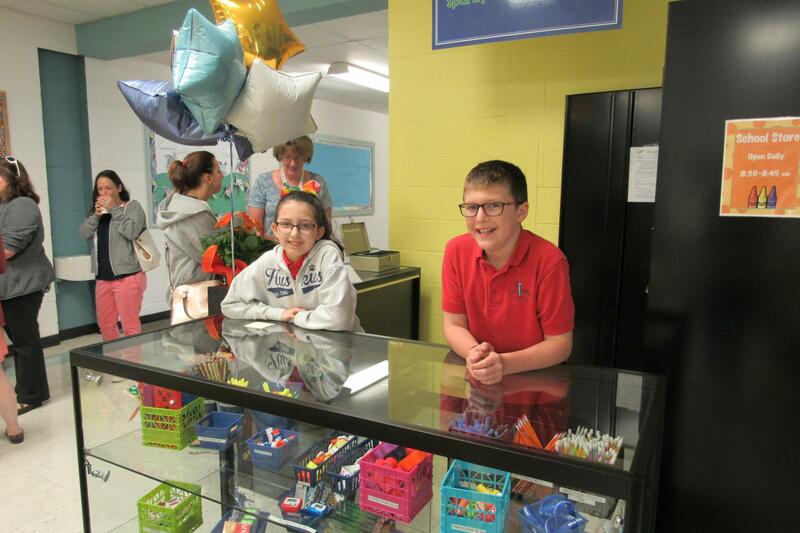 The St. Christopher School Store, located in the school lobby, offers school supplies to students for purchase. The store is staffed by student volunteers and provides a fun way for students to learn how to deal with customers, handle money, track sales, and other responsibilities. The store is open every morning from 8:30 to 8:45am. This is one of our most popular extra-curricular activities. For five weeks in the winter, students in the Ski Club travel on Friday afternoon from St. Chris to Crotched Mountain to hit the slopes.Ski club is open to students in grades 3-6. Younger students attending with a parent are also welcome to ski and take lessons! Parents and teachers chaperone the program. There is a separate fee for this activity. The mission of the Student Council is to encourage school spirit and be of service to our school and church. Members are elected from each of the 5th and 6th grade homerooms. They represent all students in the school. Some of the responsibilities include leading morning exercises over the intercom, organizing Dress Down Days, reading to the lower grades, making posters, escorting guests around the school and assisting teachers with special projects. Student Council meets during school hours. Sunshine Math is a K-6 enrichment program that encourages student of all abilities to extend themselves beyond the normal math curriculum. On a weekly basis, students read and complete a set of problems. The problems are “starred” based upon the level of difficulty. Four stars are the most difficult. Students turn in completed worksheets which are reviewed by parent volunteers. Volunteers give positive feedback and when needed, offer some suggestions for how to solve the problem. Volunteers track progress and provide recognition for participants. Because Sunshine Math work is completed at home, there is no meeting time. Students learn about world geography as they travel the world to locate places and answer questions. This program is open to children in Grades 1 – 6. Topics include questions on: landforms, bodies of water, location, topography, longitude and latitude and place. Volunteers review and correct the worksheets, track progress and provide recognition for students. Because work is completed at home, there is no meeting time. 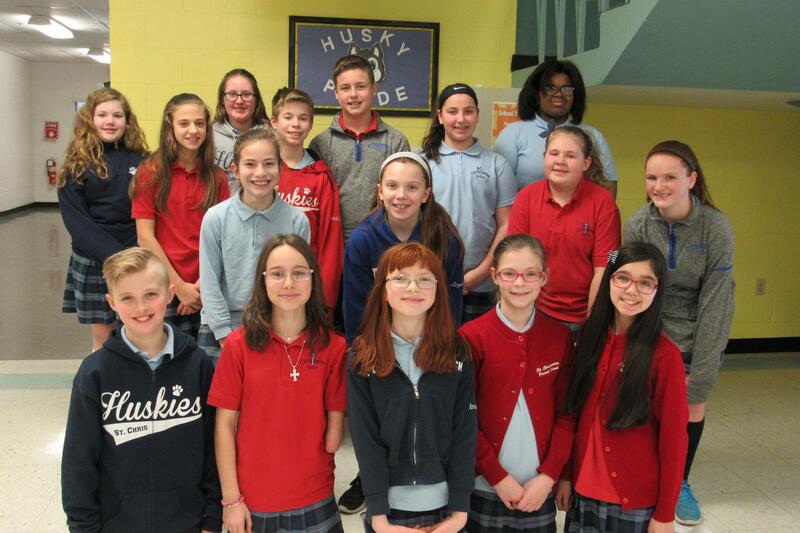 Each year, a group of 6th grade students works closely with parent volunteers to produce a 50+ page school yearbook. Once the students decide upon a theme, they learn how to use various computer software programs to design the cover and create many special pages. They also take pictures of different school activities, layout photo collages, select clipart, distribute questionnaires, draft text, and gather information as needed. Meetings will take place at a variety of times during the year, including before and during school. Catch b-ball fever! St. Christopher students in grades 3 to 6 have the opportunity to play CYO basketball in the winter months through our school teams, and a good number of both experienced and novice players get involved each year. The 3rd/4th grade team is coed, while both the boys and the girls have a team at the 5th/6th grade level...and all teams have a great time! Many of the students continue on to play at the junior high level for Nashua Catholic. In addition, students take part in Nashua Catholic's annual "Battle at the Barn" which showcases Catholic school teams in an informal, fun event at the end of the basketball season. The science and technology club is a program for 4th-6th graders that selects various science and technology topics and presents them in three to four week units. We show the students how a particular science or technology is visible useful in their everyday lives. We also tie topics together so that the students understand how fundamental science and technology is in understanding the world. We are looking for subject matter experts to come in to speak to the topic of their expertise, from cooking to astronomy, chemistry to geology, and anything in between! 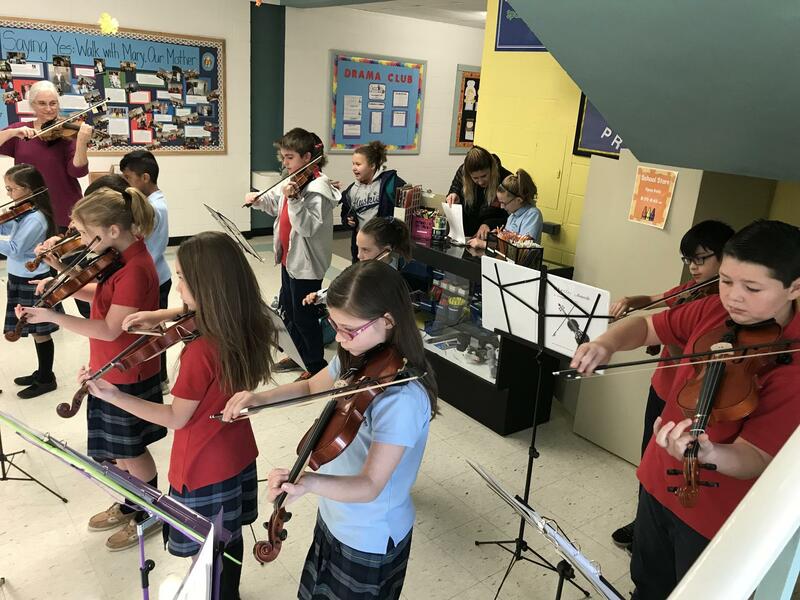 Fiddle Squad at St. Christopher School is a fun opportunity for children to learn how to play the fiddle/violin, and enjoy making music together. The Fiddle Squad plays music from a variety of fiddle traditions including Irish, Scottish, Cape Bretton, Appalachian and more. Fiddlers have the opportunity to learn from the very beginning and note reading skills are included in the instruction. Performance opportunities come up throughout the school year and students are eager to share their songs! Beginning and Advanced sections of Fiddle Squad are available and meet before school, led by Alison Bailey. Students in the third through sixth grades are welcome to join.